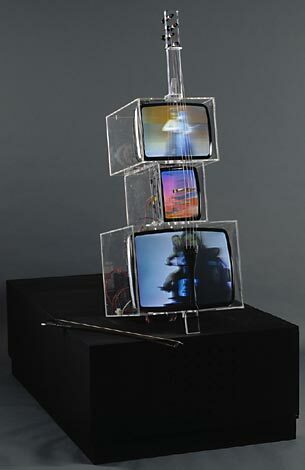 The artist Nam June Paik passed away yesterday at the age of 74. TV Cello: Finnish Dream. The collection of the National Museum of Contemporary Art, 1991. Even though I am a quite a complete dilettante in the field of arts and as young (as well as now) I didn't show any specific interest towards art except what a newspaper-reading youngster wanting to give a impression of an intellectual would have to need to know, Nam June Paik must be the first Korean name I ever learned. Well, perhaps I also had memorized the name of the DPRK ruler thanks to the curiosity his outstanding exploits and style of rule commanded in the West. TV-cello: Finnish Dream, which belongs to the collection of the Museum of Modern Art, is from 1991, but its origins are in the 1960s. Paik met the classically trained cellist Charlotte Moorman in New York in 1964, and the two set up several performances together in the following years. Sometimes Moorman played a cello made of TV monitors, and sometimes he played an ordinary cello dressed in TV bra made by Paik. Paik and Moorman had in common the intention to break the conventions of performing classical music. Paik designed TV-cello: Finnish dream for the opening of an exhibition in the Ateneum museum in 1991. Paik Nam Jun was a Korean artist. 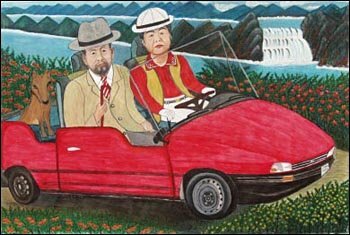 He was recognized as one and thought of himself as one (as far as I know), but Korea is a place where his art would not have been possible, and I'm not talking about just earlier poverty and lack of resources or even politically and socially repressing authoritarianism. Did he create Korean art? I don't think so, and there's no need to do so either. We do watch TV everywhere in the world don't we. Ohmynews tells that a memorial altar (? punhyangso) has been set up for Nam June Paik in the National Museum of Contemporary Art in Gwacheon, next to his work Tadaiksôn (多多益善, "the more the better") which towers in the spiral space. Buam-dong, Jongno-gu in Seoul. In this place called "the village behind the Blue House" everything takes place slowly. In the alleys lined by rice shops, barber shops, and Chinese restaurants the pace of the residents is not hurried, and grandmothers are enjoying the winter sunshine and chatting in front of the grocery store. Dram Man has good comments on the choice of the son to be involved in the business; I failed to think of the economical incentives that he points out. In fact, granny's business is apparently good: two thirds of her ttôk is sold to Gangnam people, and the several art galleries in the vicinity are her regulars (reappreciation of traditional ritual food). 국방위원장께서 중국 갔다오시고 바로 현지지도를 하러 가셨나 보다. 아니 근데, 살이 빠지셨다고 하니, 장군님의 턱을 보니까 옛날 사진일 터. But it was not only the supporters of Dr Hwang (he still has his doctorate intact, doesn't he?) that used the same term to ridicule the quality of programming concerning the case. A bit more than a week ago a KBS newsprogram Sisajungsim ("concentrating on current events") aired a program which apparently presented all kinds of conspiracy theories around the issue of Hwang as equal to the better established facts. 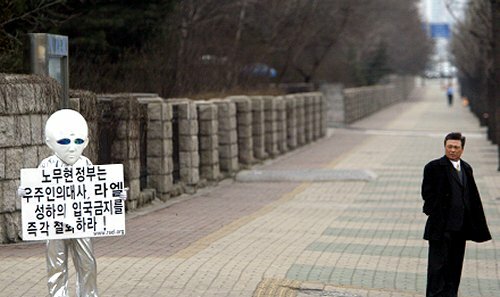 Jin Jung-kwon, the political commentator and adjunct university teacher who nowadays hosts a radio program at SBS, commented in his program that KBS deserves to be renamed DBS (dongnebangsong, "neighborhood broadcast") for airing such nonsense (article in Pressian). This is just a reminder for myself that tongne is not just a cosy term for neighborhoods and the sphere of one's daily activities, implicating a bit more humane relationships, reciprocity (I am an anthro after all), more chông(情) than in other environments; that it does have implications of class and stratification as well. It's not a coincidence that tongne isn't used that much about more well-off apartment neighborhoods. (I was also reminded of this when translating the outline of my thesis to Korean; neighborhood goes well in English, but its closest equivalent in Korean, tongne, is more nuanced. 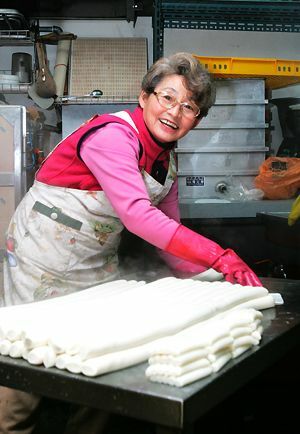 "Neighborhood business" is tongne changsa, but it is also chugô chiyôk sogyumo saôp/chayôngôp. This is a blockbuster of a book. Nothing like it has been written since Lévi-Strauss’s Structures élémentaires de la parenté (1949) or Meyer Fortes’s Kinship and the Social Order (1969). Yet in the sweep of its evidence and argument, Godelier’s summa is more ambitious and far-reaching than either of these. It is at once a major intervention in the discipline of anthropology, and a work of the widest human interest. Kinship has the reputation of being the most technical department of anthropology, the least accessible to a general public. But while Métamorphoses synthesizes a huge range of complex materials, it is written in an unfailingly lucid style that makes no assumptions of professional familiarity with terms and debates about kinship, but always takes care to explain them in language anyone can understand. The book is both a monument of scholarship and a gripping set of reflections on universal experience. It is certain to be read and discussed for years to come. Among the several Korean map search services, seems that only Freemap works properly with Firefox. It was 700 meters from my place to Mr Pak's rice bakery. I think it was already before the news of the research fraud by Dr Hwang hit the news, at the time of the biggest hype around his alleged achievements, I passingly thought of the Raelian movement, a bunch which sees humans having been created by aliens and which has been active at least in talk about cloning humans. Had I now been following Korean affairs I may never have gotten aware of the movement, which attracted a lot of attention in Korea at the time of Mr Rael's visit in August 2001. It is interesting to do the mental exercise, for just a few seconds, and ask oneself - why would Dr Hwang play with the hope of millions of people who are desperately waiting for stem-cell cure to be available for either themselves or one of their relatives? Why would he declare that he has made these lines, if he wasn't able to do it, knowing that millions are watching him and that he would have to deliver them soon? We at Clonaid, believe that Dr Hwang has cloned human embryos and has the knowledge to develop stem cell lines. Dr. Boisselier has offered Dr. Hwang to collaborate in one of Clonaid's laboratories. Oranckay's definitive blog note on the case of Dr Hwang starts by thinking of him as a kind of a spiritual leader of a religious cult, and Raelians offering him a job won't help Dr Hwang to escape this conclusion. Raelians seem to have found someone of their kind. Hankyoreh has an apparently important series of articles on the yanggûkhwa... polarization of the society. I don't see yet any special page which links all the articles of the serial, so I'll collect them for the time being here. A good, very good serial, but Hankyoreh could benchmark for example Chosun Ilbo for creating a special page for an easier access to all the articles in the serial. new blog: "Rate your students"
The Rate Your Students blog offers college professors a chance to rate their students. We love most of our students, but get annoyed at the entitled members of the iPod generation and their casual relationship to a college education. Ok, let me let off some steam as well. • Not keeping deadlines for assignments. It's not really my fault that I didn't manage to make a menacing impression enough to have the students hand out their assignments in time; it's the lax atmosphere of Finnish universities. I thought of having a minus-point system for each day late, but then in the end I didn't. • Too little response and feedback during the course. I had this course blog, and all I got from students attending the class one one single comment. There was also one by Oranckay, in which he suggested I make the course schedule available in a language more widely recognized than Finnish. Ok, let me emphasize once more that even though not overactive in class or online or not attentive of assignment deadlines (some were! ), the students of my class were a nice bunch, attended classes despite of there not being a final exam based on class contents. And one thing still: several students wrote in their assesments that the classes I did with MS Powerpoint (two out of 12) were good. Do the modern-day students need typed text and bright pics projected on a canvas for an interesting class? Even though I recognize the advantages of presentation technology, especially after having seen some very fine guest lectures using text, video, and audio, but I haven't (yet) learned to be so fond of Powerpoint, mainly because I still lack the routine needed not to waste too much time in preparing the presentations. Perhaps some day I'll find the way to prepare a class and transfer it to Powerpoint in a reasonable manner timewise, but that's not yet the case. 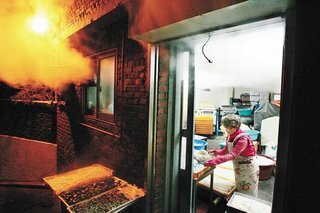 This is not the laundry grandfather of whom I've made occasional notes in this blog but Mr Ryu Hae-yun (78), a laundry keeper, who has an exhibition of his paintings in Ssamzie Gallery until January 23 (a story in Ohmynews). Mr Ryu took up painting only seven years ago. He continues keeping the laundry, and paints in the corner of his shop in the mornings and late evenings. More reproductions of Mr Ryu's paintings in his son's blog. Ssamzie Gallery is in Insa-dong, subway #3, Anguk station, exit 6, 100 meters down the main street. Hankyoreh: President Ahmadinejad has been constantly criticized by Western nations since he took office in last August. = They criticize those who are against their interests. Nevertheless, since he took office president Ahmadinejad has emphasized cooperation with the nations of this regions and with Islamic nations. Hankyoreh, what about telling even a bit of what's been behind the "constant criticism of Western nations", if you don't have the guts to ask whether it's appropriate to call for a destruction of a certain nation? For that, I'll refer those who might want to know to Al Jazeera. Lately Hankyoreh has given a lot to wonder what its actual views are on human rights, application of laws, and democracy in the Korean peninsula.